I was the author of the MBA Distance Learning Project Management course material for University of Durham in 2002, and co-author of the updated material in 2011. The approach to project management, its practice, and the lessons for success all apply to all projects. Project success depends on engagement before and after completion of the project. The best approach to project management depends on acceptance by those involved: adapting to meet the needs of the users is vital. For a confidential discussion on project management and how it can help your organisation please contact me. Why do they run late? Allow interruptions, for tea breaks, or a well-earned drink. Find things we had not expected to, and they take longer.... odd things like snippets in newspapers that catch our attention, the very newspapers we are using to catch the drips from our now static paintbrushes. Change our minds. The colour is wrong; we change the position of a wash-basin, the type of taps, the door handles and what about having a separate shower? In a nutshell, on average people don’t plan well, and do change their minds. For a simple decorating job the extra cost probably doesn’t much matter. Compared to the hassle of disruption, the extra week or more of tiptoeing round obstacles, and not using one of the rooms might be bearable. But suppose we applied this approach to the real world of work, what would the repercussions be? We planned the work in detail, when it reached the appropriate stages. And we had a great team arrangement, with clear roles and responsibilities. These principles can be applied to any project, series of projects, or whole programme. A vital component in success is understanding what might go wrong, in recognising the risks and managing them. To make sure your project is well-founded, properly thought throughm with clear goals, please contact us. Some years ago some colleagues and I discussed concepts for explaining how projects must fit into programmes, so that each slice of a project would provide benefits, and all of them would combine to fulfil the overall goal. Delivered in slices, or as Tranches as we called them, each of them would help achieve measurable benefits. Combined they achieved the agreed goal. 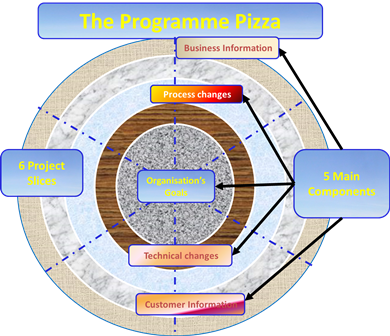 A bit like a pizza, The Programme Pizza. In this example you have six separate projects, each of which is able to deliver part of each of the components. The organisation needs to improve the way it creates and uses customer and business inforation, there will be some technical changes, and processes will also change. It has devised a set of six projects all of which need to be maanged in accordance with the programme as a whole in order to realise the organisation's goals. Each of these projects will provide some of the benefits, depicted here for convenience as euqal parts of the slice. Provided that all of the projects share essential approaches - a common language, a set of common governing protocols or 'rules', and an agreed way of sharing information during hte programme - everyone involved should be able to work together, following a consistent approach. They can share the approach to risk management, progress management, communications, reporting, cost management, and success measurement. And if they have any issues that might affect any of the pther projects and therefore the programme as a whole, they can share thos issues too, enabling the issues to be resolved, and progress made. This approach reflects the essential conditions for managing successful programmes. To discuss how to set up a project office and a programme please contact us.